Taste test: The problem with most lightly salted potato chips is that less salt usually means less flavor. These are no exception. 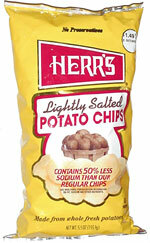 Herr's chips are usually great, but the taste of these is pretty bland. 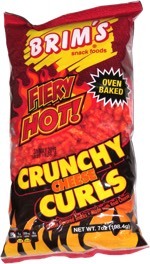 If you're going to have these, I'd recommend having a salt shaker handy. That way, you can enjoy the enhanced flavor that comes from adding salt  and still be able to feel good about yourself because you bought a healthier type of chip. Smell test: Potatoey and good.